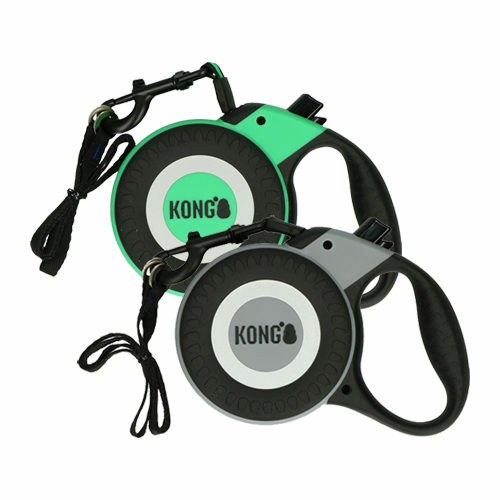 KONG Retractable Leash Reflect is a retractable leash with reflective details and bright colours. Ideal for walks in the dark. The braking and locking mechanism of the leash contributes to ideal control. Thanks to the softgrip, the Retractable Leash Reflect is comfortable to hold. The Retractable Leash Reflect from KONG is a retractable leash with reflective details and bright colours. Ideal for walks in the dark! Thanks to the highly visible details, you will be easily spotted by other road users. Thanks to the braking and locking mechanism, you will have optimal control. The handle with softgrip gives you a comfortable grip. The Retractable Leash Reflect is suitable for dogs weighing up to 30kg or up to 50kg. The leash rolls out up to 5 metres. Have you used KONG Retractable Leash Reflect before? Let us know what you think about this product.